The monks of Notre Dame have decided to join the Holy Family in their journey to Bethlehem, although in this part of the world, Bethlehem is called Rhyndaston! Below are some shots of the monks on the move. This afternoon Notre Dame Priory celebrated the clothing ceremony of its first four novices, Brother Bede Mary (Tomas Cannavo), Brother Gregory Mary (Alec Hobbs), Brother Joseph Mary (David McMahon) and Brother Bernard Mary (Graham Leach). 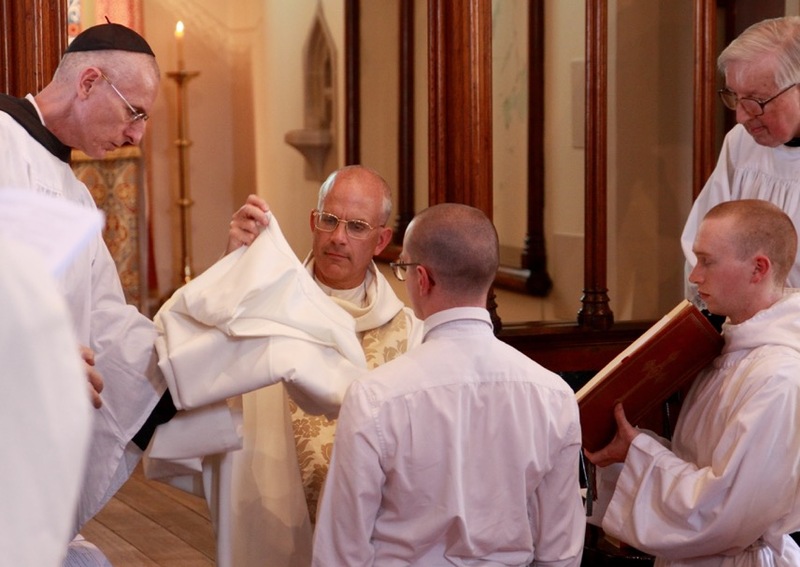 The community was blessed with the presence of Archbishop Porteous who officiated pontifical Vespers, immediately before the ceremony during which Father Prior imposed the Holy Habit and admitted the new novices. We were joined by around 50 friends who then shared refreshments with us at the house of David and Elisabeth Daintree. Father Prior's exhortation to the new novices will be found under the "from the Prior" button. After the ceremony, Archbishop Porteous, Fr Prior and, from left to right: Brother Joseph Mary, Brother Gregory Mary, Brother Bernard Mary and Brother Bede Mary. Father Prior with the new novices and their parents. Father Prior chants an oration over the newly clothed novices. Father Prior washes the feet of the to be clothed postulants. Giving the kiss of peace to Brother Bede Mary. Chanting the Memorare before the Lady Altar. The white habits laid before Our Lady before the ceremony. Preparing to clothe Brother Gregory. Today on the feast of All Saints of the Benedictine Order, we were overjoyed to welcome another postulant in the person of Dominic Swan. Dominic, who is from Brisbane (that makes three Queenslanders in the community! ), had completed his three months of aspirancy, and expressed the desire to be received as a postulant. We give thanks to Our Blessed Lady for this gift, and ask her to lead him along his monastic journey. For the past few weeks, our Sunday Masses have been supplemented by organ pieces played by postulant Tomas on the lovely pipe organ in St Patrick's Church. It adds a valuable dimension to our liturgical prayer for which we, and our occasional guests, are most grateful. Chanting Terce before High Mass. 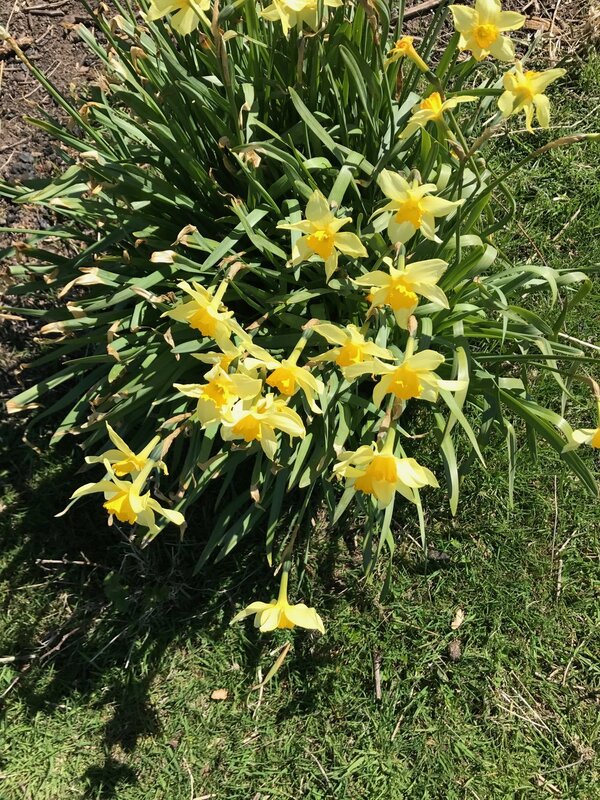 Nature's springtime rebirth at "The Pearl"! In an effort to provide for the subsistence of our small community, we have just added a new button to this website, called "Monk Shop". You will find there the beginnings of what we hope will one day provide for the community. 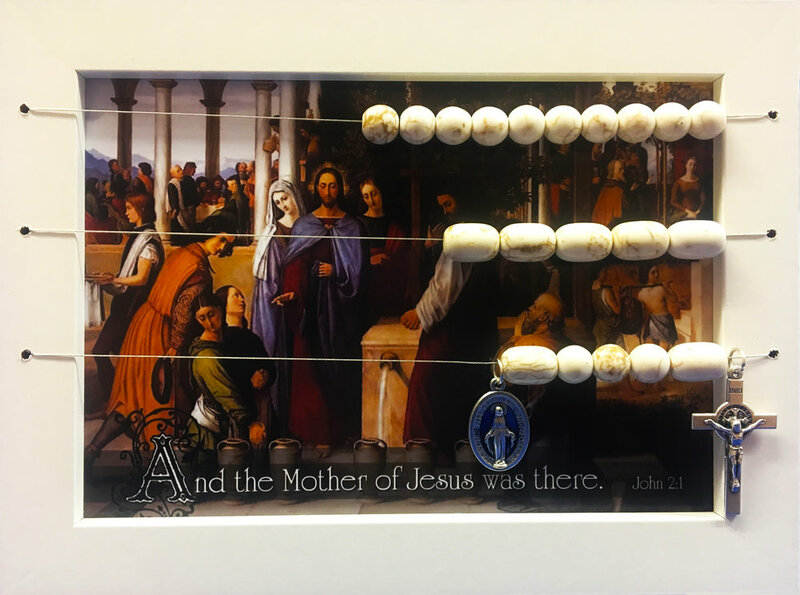 This month's featured novelty is the "Kitchen Rosary" which we hope will increase the number of Rosaries offered to Our Lady during this month of October. Through the intermediary of our good friend Brian Andrews, we received from Nick Beveridge in New Zealand this fabulous Pugin chasuble which we used for the first time yesterday on the feast of the holy apostle St Matthew. May Our Blessed Lady reward the kindness of such generous benefactors, and may we always make good use of such precious gifts for the beauty of Divine Worship. The past few weeks have seen ongoing progress at Margarita, all in preparation for the real (building) work to come, soon we hope. Expert tests soil in preparation for planning approval. By dint of hard work, the brothers have managed to get rid of the huge tree that had been left near the small house at "The Pearl". A recent photo showed Father Prior with the chainsaw. Well, for the time being, Father Prior is out of work (or rather, the chainsaw is!, Father Prior never having enough time for the mountains of work awaiting him everyday...) The tree is gone, transformed into firewood, and the briers are gone, transmuted into ashes and smoke. The brothers are seen here saying the office of None last Thursday, as they prepared to finish up their day's work and head back to Lindisfarne. It took a while to get the fire started, but we got there! Talking about moving in, Father Prior is here seen discussing possibilities with local builders and Martine Watkinson. Since 26 July the community has started clearing things out on their new property. Until we can get a large enough house built there, the plan is to go out once a week to tend to various needs around the land and prepare it to receive its monks. Last Friday, the community said good-bye to the 8-seat Kia that it had been renting from the archdiocese since the beginning of the foundation. Father Prior was reminded of the early days at the end of last year when this car accompanied his baby steps in Tasmania and wishes her a bright future. The need to limit expenses required this separation. This Sunday 30 July, Father Prior blessed the small house on our new property and the community shared its first meal there since settlement day. Three good friends shared the occasion with us and made it very special. Divine Providence gave us the joy of rainbows that were quite visible, and, it would seem, rare in this dry part of the island. It gives us courage to think that a new covenant has been made between Heaven and our fledgling community. Now, so much to do to get the land ready for its inhabitants! Rainbow seen in Rhyndaston and in Cole River Valley. "I will bring them into My holy mount, and will make them joyful in My house of prayer: their holocausts and their victims shall please Me upon My altar." These inspired words from the Prophet Isaiah (56:7), as the chapter verse for the monastic office of Sext on this feast of Saints Joachim and Anne, were being chanted by the brethren when the conveyancer rang to say that the settlement was complete for the purchase of what we hope will become our future monastery. The news is that Notre Dame Priory is now owner of 64 acres of land in the small town of Rhyndaston, Tasmania, just 7 minutes north of Colebrook in the Coal River Valley. It is roughly 50 mn north of Hobart, and about 1 h 45 mn south of Launceston. The photo which has been on the "News" page of this website featuring Archbishop Porteous, Father Prior and the community was actually taken from the property several weeks ago. The view, as you can see, is stunning. Even though it is not visible on that particular photo, Mount Wellington rising majestically over Hobart can be seen from the top of the land. Below there are a few other shots showing the land and the small house which is on it. Before we can move in however, we will need to get other accommodations set up. Our work for the next weeks and months is cut out for us, but you will be hearing more about that! This evening, the entire community is chanting the Te Deum in thanksgiving to Our Lady and St Joseph and with gratitude to the generous benefactor whose loan made the purchase possible, as well as to all other benefactors who continue to support our work. Please unite with us in giving thanks to the Lord. God love you all! Upcoming visitors to the priory are in for a sight: Today on the solemnity of Our Holy Father St Benedict, our four postulants donned their newly made postulant habits. These are essentially a short habit going down to mid-thigh. It allows them to gradually get used to wearing distinctive religious garb and prepares them for the long habit and scapular which is still a few months down the road. Father Prior has made his way back to Tasmania since Sunday afternoon. Having completed the retreat in Wales and the two retreats in Ireland, he went to the Abbey of Flavigny for two days where he was warmly welcomed by the abbot and community. The 6th of July was the 15th anniversary of his ordination to the priesthood, and he was happy to celebrate it with the two confreres with whom he was ordained: Dom Bénigne Marie Gaillot-Drevon, now choir master of the abbey, and Dom Jean-Bernard Marie Bories, now novice master and subprior of the abbey. That same day, Father Prior was invited by Abbot Antoine Marie Beauchef to speak to the community about the Tasmanian foundation. He did so for about and hour, showing photos and fielding questions. It was a blessed time, only too short. The next day, he flew back to Hobart, via London, Kuala Lumpur and Melbourne. With great joy he has been reunited to the small community of Notre-Dame. After completing a first retreat in Pantasaph, Wales, with Fr John and Br Basil, Fr Prior is now in Ireland holding a second retreat at Ards Friary, Creeslough, Donegal. On the way there the three monks made a stopover at Silverstream Priory, Stamullen, County Meath. Fr Prior was blessed to meet Dom Mark Kirby shortly after his community moved to Ireland in 2012, and since then he has gone each year at least once to visit and help the fledgling group. This time around, he was delighted to see the great progress that has been made. In addition to the Prior, there is one solemnly professed monk who is a priest, two junior professed, three novices (one of whom is a priest) and three postulants, and many other knocking at the door. Even more important however is the official erection of the community which took place this year by the Bishop of Meath. Silverstream Priory is henceforth a fully approved and established monastic community of the Church. This is all very encouraging for us as well, as we set out on a path that is similar and hopefully will lead to the same goal. Si solum fiat! Dom Pius with Dom Mark Kirby. Back to the "old world"
Last Friday, Father Prior flew to Europe for a three week tour during which he will hold three retreats in the UK and Ireland in company with Fr Jean de Britto and Br Basil from the abbey of Flavigny. His first stop upon arrival in England was at St Michael's Abbey in Farnborough to which he is no stranger. In fact, since the first Flavigny retreats in England in 2006, the monks have made a halt at Farnborough just about every year, allowing them to keep up with Abbot Cuthbert and community. Today, feast of Our Lady Help of Christians, was an important one for Notre Dame Priory. This afternoon, just before First Vespers of the Ascension, Father Prior welcomed officially as postulants Tomas Cannavo (Adelaide), Alec Hobbs (Brisbane), David McMahon (Sydney) and Graham Leach (Brisbane). The four men have just completed three months of aspirancy and have decided to take the next step and actually enter monastic life. A big step for each one of them, and also for their loved ones at home. Postulancy, like novitiate, of course involves no commitment on behalf of the candidate, but the significance of the moment is actually stepping into the community life and asking to begin formal initiation as a monk. 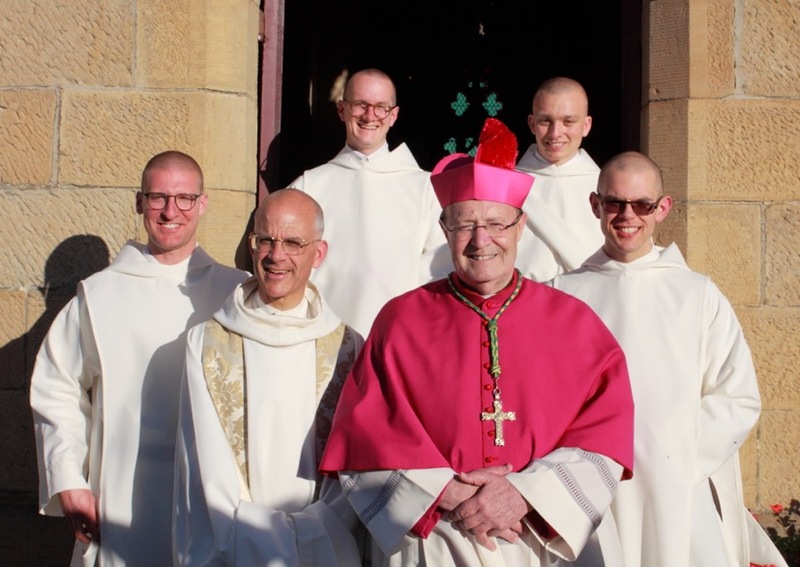 As a concrete sign of their desire to pursue this path, they all were shorn of their hair, in the hope of being clothed with the Benedictine habit a few months down the road. Father Prior entrusts them, each and all, to your good prayers, thanking Our Lady for this special gift on her feast day. Postulants Tomas, Alec, Graham and David with Father Prior. Saturday 13 May will also be remembered as the day on which we received a lovely statue of St Joseph, offered by some generous benefactors from Northern Tasmania. We blessed the statue after the consecration to Our Lady, and he will henceforth, with his Immaculate Spouse, preside over the destiny of our community. The photo also shows an image of St Mary of the Cross, secondary patroness of the priory, and Bishop Willson, to whom we also entrust our endeavours to establish ourselves. Today is the centenary of the first apparition of Mother Mary to the children of Fatima. It is also the centenary of the episcopal consecration of Eugenio Pacelli who would later endow her with a very beautiful Mass to honour her Immaculate Heart. On this day, two significant events have taken place in Tasmania. First of all, Archbishop Julian Porteous consecrated Tasmania to the Immaculate Heart of Mary in a major ceremony in his cathedral of Hobart, which included the crowning of the Pilgrim Virgin Statue of Our Lady of Fatima by His Grace himself, the Rosary recited while walking in procession around the cathedral with the statue, and the Litany of Loretto. In the text he used for the occasion and which began "I, Julian Porteous, eleventh bishop of the See of Hobart, do solemnly consecrate Tasmania to the Immaculate Heart of Mary", the archbishop prayed: "Let there be revealed once more the infinite power of Christ's redemption, the outpouring of His merciful love. May it destroy the power of sin and evil among us. May consciences be transformed to know the truth revealed by God and witnessed to in the Catholic Church." The monks of Notre Dame Priory were honoured to be present on this momentous occasion, and they join with their archbishop in calling down the blessings of the Lady of Fatima upon all the inhabitants of this island. The other significant event, much more circumscribed, was the consecration of Notre Dame Priory to the Immaculate Heart. The text used by Fr Prior for the occasion can be found under the "From the Prior" tab. Consecration ceremony in the small priory chapel.